Are you crazy about cats as I am? I bet you are! Who doesn't love a cute furry ball? 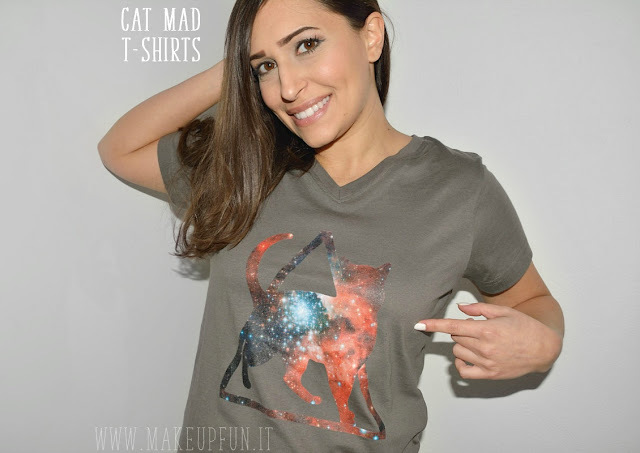 If you're into everything-cat, look no further than Cat Mad, the shop that has amazing t-shirts with cat-related prints. Based in the UK, James makes some of the designs and he also promotes a worldwide cat-loving design community. Cat Mad ships internationally, from $4.99 in the US and everywhere else from $7.50. All shirts are printed on demand from a third party in Pennsylvania as the shipping is cheaper over there, but you will have high quality materials! You can decide which color you want for your t-shirts and find many styles too, from v-neck to tri-blend tees, as well as tank tops, hoodies and standard tees. They've done this recently with SocialCATwork to support their website/app development to re-home homeless cats, and with @ProjectFeral, @little.c8 and @teamfancykitty on Instagram to support their various cat causes with approximately 20% of each relevant sale back to them. My shirt is the Triangle Galaxy Cat V-Neck, size M, color graphite gray. The material is 100% cotton and has a flattery style. I love that it's stretchy but still not too tight nor large. It's perfect with a pair of jeans and pretty much anything casual. The cat is inside a triangle and filled with a galaxy print. I find it very adorable and interesting! Head over to Cat Mad and sign up with your email to be informed about offers and free shipping promos! They now have free worldwide shipping running from today, 27th January till the 1st of February with code SHIP17 - don't miss it! Love this so much. I am a total cat person as you can tell. Ahh .. I love this! We have four cats of our own who we love and spoil. I'm putting the shirt on my wish list. I'm not a cat lover but I do love this shirt! Interesting style. My friend is crazy for cats. She has 3 cats and this would be the perfect gift for her!